This simple style PC desk is the perfect furniture to fit your home and office. With its large desktop, it provides plenty of space for office/home appliances. Clean and minimalist design creates a large activity and storage space under the desk. Featuring its solid and sturdy, the home office desk is made of PB-wood with veneer surface and water-base painting, and certified for Greenguard Certificate with Low Chemical Emissions.The metal frame is coated in anti-rust to achieve a greater durability and stability. The T-shaped steel legs provide a solid footing to prevent movement as you work but also support a heavy load capacity. Approved by ISTA-3A crash-proof standard, individual package for every single product, it is convenient to transport and store. 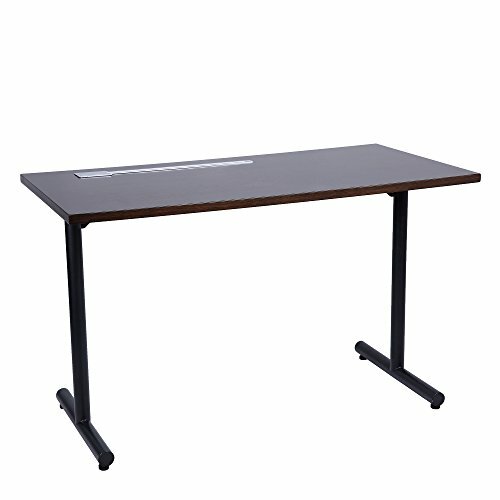 This multi-function desk can be used as office workstation, writing desk, computer desk, pc desk,gaming desk etc. Personalize your home/office with this minimalist designed desk! Product Size: L47.2" x W23.6" x H28.9"
Packing Size: 51.6" x 31.8" x 5.5"
High-End & Sturdy Frame: The highest level solid wood surface with water-base painting look nice and very easy to clean; Steel support with width T-shaped legs and the triangle Junction to ensure good stability(withstanding 300 lbs). The adjustable Pad also ensure the stability even on the uneven floor. Easy to assemble: Just need to install the two T-shaped legs, can easily install it by yourselves, and can be finished in 10 minutes to save your valuable time.